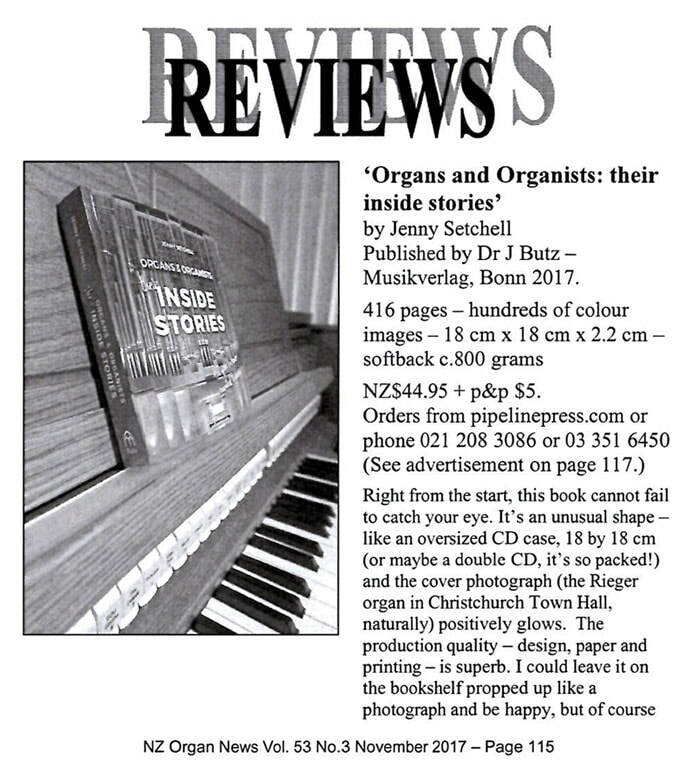 "Organs and Organists: Their Inside Stories - ​All you (n)ever wanted to know"
"An absolute must-have for ANYONE remotely connected with the king of instruments"
Scroll down to read reviews of Organs & Organists. ​"Organs and Organists: Their Inside Stories" is a complete cornucopia of everything you might have (n)ever wanted to know about the organ in a novel and often hilarious way. ​Following Jenny Setchell's first book of anecdotes, "Organ-isms: Anecdotes from the World of the King of Instruments", this follow-up volume enlarges upon the subject to describe the instrument for non-players as well as those familiar with it. "Inside Stories" shows the heart of the world of organs in way you have never seen it before; with glorious colour photographs on almost every page, you get taken behind the scenes of the facades that are admired the world over. Enjoy the problems and funny situations that organists find themselves in and unlock the world that is often seen as stuffy, or just plain weird. It is nothing of the sort! (Well, it can be incredibly peculiar. But you'll have to read it to find out about that). ​The foreword is written by Christopher Herrick, former Westminster Abbey organist, himself a renowned recording artist and international concert performer. With a personal account in PART TWO, author Jenny Setchell reveals the sometimes distressing but often hilarious moments she shares with her husband, concert organist Martin Setchell, as they cope with the highs and lows of life on the road. Intensely personal, it also explains why she hates being asked how her lazy holiday in Europe went. . . 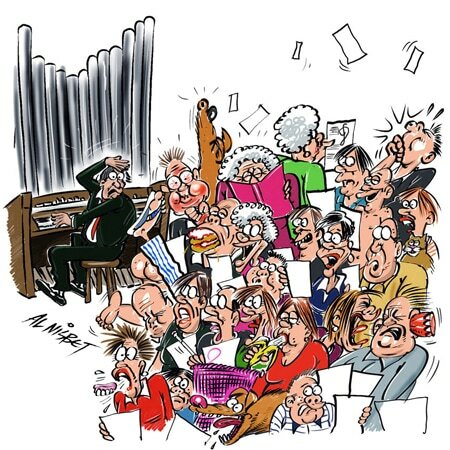 In PART THREE, with six short satirical articles, Adrian Marple describes the reality of working for an English church as organist and choirmaster. Adrian is known for his witty and illuminating accounts of life in the loft through his blog. PART FOUR consists of anecdotes by about 60 organists from around the world, whether they be small-town church musicians or touring concert artists. Awkward relationships with clergy, frustrating encounters with congregations, and happenings that take everyone by surprise: it's all there. 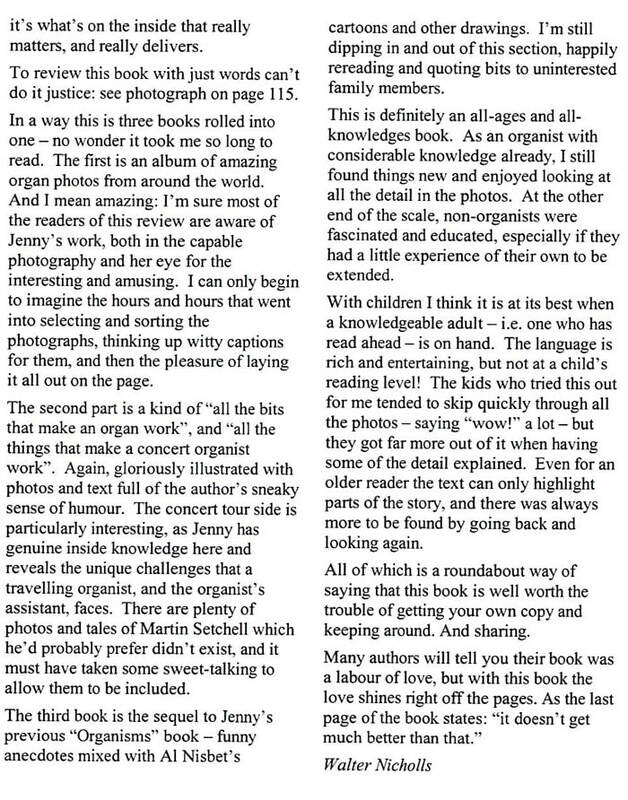 The book aims to show in pictures - with a light, humorous touch - what other books only talk about. Aimed at those who don't know much about the King of Instruments, it is equally appealing for those who play it for a living. It does so in a novel, entertaining way, with more than 470 photographs, cartoons, and drawings. Regardless of whether you are an organist or a musician/non-musician, this book is full of wit. As an organist I sigh/laugh out loud when reading because there are too many jokes that are so close to reality. I had to give up reading it on my morning commute due to the smiles and near laughing-out-loud - people were looking at me to check I wasn't reading Fifty Shades of Grey. ​​What a fabulous book!! Just gorgeous, front to back, and so many funny and fascinating things to read. I can’t wait till next week and the chance to really get into it! Thank you, and congratulations on this achievement!! 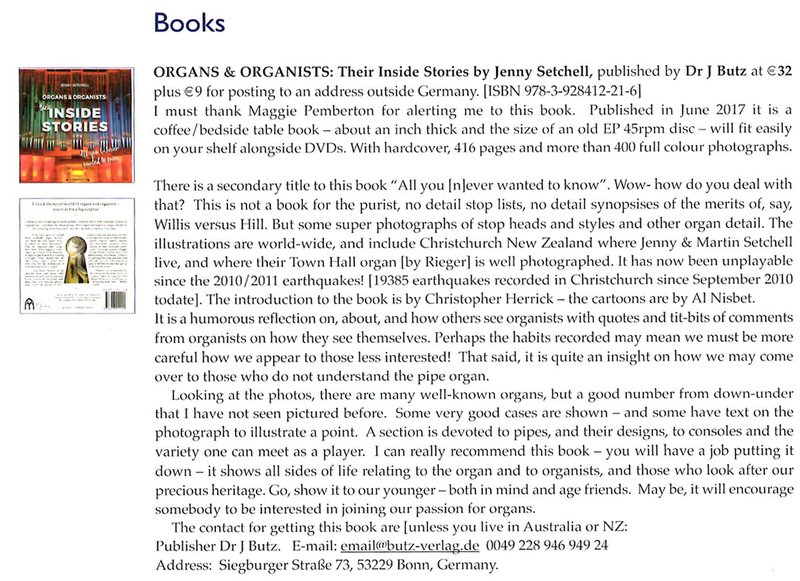 ​​I am very impressed by the quality of this book and the interesting and informative content which will appeal to organ lovers and those new to the subject alike. A variety of colour photographs and other illustrations adds to the attraction. Jenny has also had the good sense to include some light-hearted and humorous content. Highly recommended. ​​I was highly delighted to receive your book, with anticipation after enjoying your earlier volume. I can only regard it as a tour de force- what a magnificent collection both of data, photographs and stories. It rang so many bells with me although I have not had the privilege of enjoying the availability of pipe organs in recent years ... I appreciated not only the content but the wit with which you write ... So all in all please accept my gratitude for such an excellent production. ​​I can't begin to describe how much wonderfully indulgent fun it is to read this book: it's the book we organists have really dreamed about, but could never imagine being published! We really won't be able to put this one down - thank you Jenny for indulging the organ community so spectacularly. An absolute must-have for ANYONE remotely connected with the king of instruments. I received your new book (along with an extra copy for a friend) a couple weeks ago, and have been "having a ball" devouring it. Congratulations on make so many thousands of facts and figures so readable! Readers who enjoyed Jenny Setchell's Organ-isms should be captivated by this new offering from her cat-mastered desk. This latest volume of over 400 pages carries the warning "All you (n)ever wanted to know" about organs and their players. Just about all you might want to know is here." Just a quick line to say again how much I adore the new book! LOVE the pic of your sub-editors :-)) And love all the photo captions! This somewhat odd-sized book - 6 ins square - contains more than 400 superb colour photographs of the outsides and insides of organs; the bits that hearers never see. The presentation is unfussy and fascinating; it's really hard to put this book down. 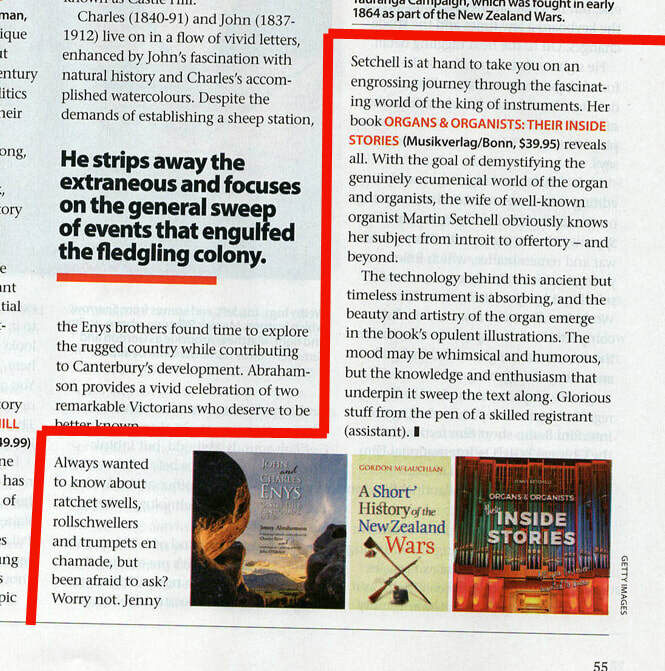 ​I purchased 'Organs & Organists: their inside stories' for my mother, who is absolutely loving the book. She is laughing a lot at the stories, some of which she can relate to, and is enjoying learning about some of the more technical aspects of organs. Clearly it is giving her many hours of enjoyment and would be the most worthwhile gift I have given her! I have thoroughly enjoyed the first two books, laughed myself silly. Congratulations on all of your books. "Apart from the engaging humorous content, what confirms this book as five-star is the quality of production - hundreds of stunning photographs by the author (a professional photographer) and exemplary high-quality production values." 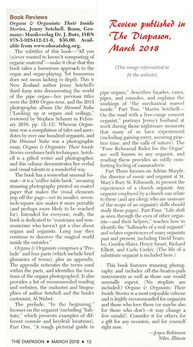 "Stunning photography and includes off-the-beaten-path instruments as well as those one would normally expect"
"...The beauty and the artistry of the organ emerge in the book's opulent illustrations." "I can really recommend this book - you will have a job putting it down -"
". . . go, show it our our younger friends, . . . maybe it will encourage somebody to be interested in joining our passion for organs." Click on thumbnail to read full review. "I had to give up reading it on my morning commute due to the smiles and near laughing-out-loud ... people were looking at me to check I wasn't reading Fifty Shades of Grey"... If you're looking for a Christmas present - look no further as this really does tick all the boxes!" NOTE: The review erroneously states that there are 148 pages. There are in fact 416. 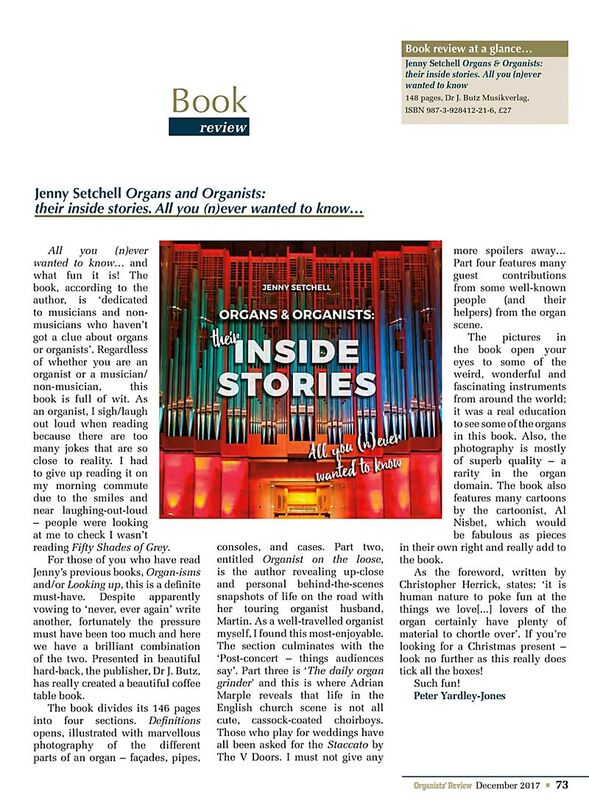 ​'Organs & Organists- their inside stories' is the latest book from NZ-based writer, photographer, and wife of organist Martin, the redoubtable Jenny Setchell. She is also surely one of the most entrepreneurial and enthusiastic, non-playing advocates of the organ today. This book, despite its odd physical dimensions, must also rank as one of the most fascinating and beautiful to ever hit the press. That it has, in these days of electronic media- and to what I presume is a fairly limited readership- is a minor miracle. When I was a young teenage organist, I used to cycle to the local library to pore over the pictures of organs in Grove's Dictionary of Music and musicians- such was the paucity of information and photos of this most beguiling of instruments. However, had the esteemed Clacton-on-Sea library held a copy of Jenny's book, I think I would have exploded with excitement. If there has been an organ book more beautifully illustrated, I have yet to see it. 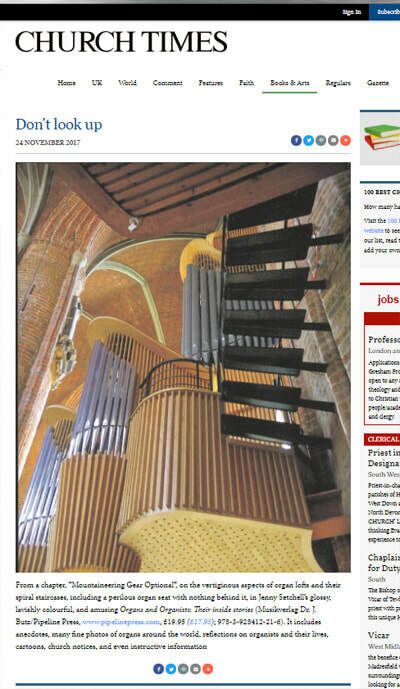 For Jenny is an expert in photographing the organ in all of its glory. But not just pretty pipes- every single corner of our instrument is exposed, all for the sake of our inner nerds. There are glorious piccies of organ benches, stop knobs, blowers, toe pistons, chamades: even of different types of sequencers! Everything you ever wanted to see is here, although even I could probably have done without pictures of said husband Martin's various organ-induced injuries! In terms of contents, it is difficult to adequately define - it's like an organ-lover's mantlepiece- just fascinating but haphazard. Anecdotes abound: similar to the author's previous volume 'Organisms', together with cartoons, lists of everything and anything, extracts from Adrian Marple's light-hearted blog of an organist's lot, and at last, something I had been dying to see - a picture of the Ratzeburg Cathedral's 'Rauchswerk': a stop which when pulled opens a drinks cabinet on the console! The photo reproduction, print, and paper quality is very glossy and is absolutely first class - it is a real coffee table/ organ bench must. My only regret is that the dimensions are not bigger as to enjoy the sumptuous photos even more, but I imagine that would hike the price beyond the reach of us impecunious organists. Readers write, and other reviews about "Inside Stories"
... a friend who had bought a copy lent it to me and I was so impressed by its contents ie the amusing anecdotes, beautiful photographs and informative text that I had to obtain a copy for myself. - Christopher S.
Reading every word and loving your book! 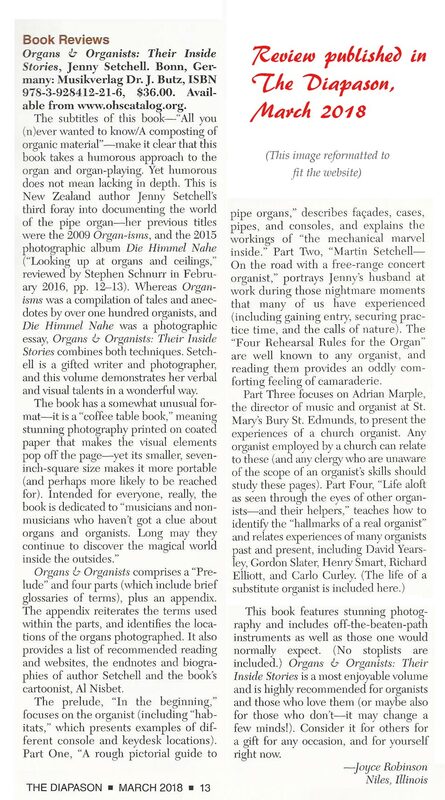 - Don H.
"Organs and Organists" arrived promptly and I enjoyed every page. Thank you. Just wonderful! Beautiful photos. I'm happy to help support your two accident-prone cats. I also enjoyed "Organ-isms". Look forward to your next book. - David H.
What a brilliant follow-up to Organ-isms! I'm about half-way through and loving the fabulous photos and fun descriptions with your signature wit. - Rodney G.
I have finished your quite splendid book, and have been well informed about the mysteries of the organ and organists, and well entertained as well. Most impressed at the huge effort required, all the work, and definitely at the final result. Congratulations indeed. I now realise how complex organs are, how difficult to play, and how plainly certifiable one must be to become an organist. - A.P. What an absolute gem of a book that is. There is SO much there that it really does take time to work through it all! I was highly delighted to receive your book, with anticipation after enjoying your earlier volume. I can only regard it as a tour de force- what a magnificent collection both of data, photographs and stories. It rang so many bells with me although I have not had the privilege of enjoying the availability of pipe organs in recent years ... I appreciated not only the content but the wit with which you write ... So all in all please accept my gratitude for such an excellent production. - L.S. 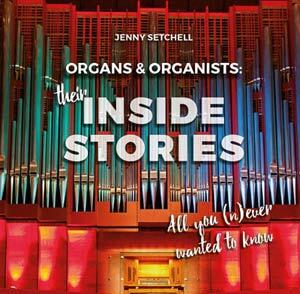 Today I received my long-anticipated copy of Jenny Setchell's magnum opus, "Organs and Organists: Their Inside Stories. "The proud owner of her two earlier books, "Organ-isms: Anecdotes from the World of the King of Instruments" and "Looking Up," I knew that I wouldn't be disappointed. I received your wonderful new book from the publishing house. Thanks a lot! I really enjoy each moment of reading and discovering; immersing in another, but yet familiar world. Your book is a masterpiece! The size, the layout, the quality of the paper and printing, the decorative elements between the chapters, all the high quality photographs, the drawings in the historical style, and, of course, your selection of the written content!It ranges from real funny to deeply touching, e.g. THE POIGNANCY OF PIPES by Dr Jeannine Jordan. Already the first pages made me laughing, by WHAT THEY MIGHT HAVE SAID ABOUT THIS BOOK. There are so many details, which simply made me grateful to own this unique book. - Christoph. I am delighted to find that it is full of your off-beat humour which we have so frequently shared on so many occasions. Margaret’s almost immediate comment was “They must have had fun compiling it” and everything in “their Inside Stories” reflects this - even the cover needs close inspection. This makes the book so special as we don’t just read it – we share it with you. The real bonus of “Organs and Organists” is that it combines all your skill as a photographer with just the right amount of background comment. I flows along effortlessly and I was up to page 63 before Margaret threatened to cancel dinner if I didn’t put it down and come to the table! Yes, she did- she really did! Well, I hope that you have now gathered that the book has really delighted us. -Ian. My copy of the book has arrived from Germany and I am thrilled to have it, especially as it is the hard-cover version. Congratulations to you on your superb production. It is packed with helpful information for lovers of the organ, tempered with your good humoured additions. The range of photos is a treasure in itself, brilliant photography of so many organs around the world. I have read it from cover to cover, but of course it is book for continual browsing, so dipping into it will be a long-lasting delight.